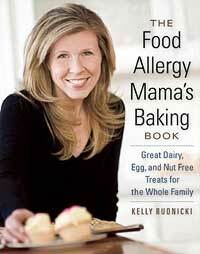 The “Food Allergy Mama’s Baking Book” is a fantastic book written by author and food allergy mom Kelly Rudnicki. The Food Allergy Mama’s Baking Book is a one-stop guide to delicious, everyday baked goods free of dairy, eggs, and nuts — the most common food allergens. It offers timeless, foolproof recipes that are easy to prepare even for kitchen novices. It’s an invaluable resource for home bakers (and their families) who loves sweets and treats. These recipes are more than delicious enough to be enjoyed by everyone who craves great baked treats, whether they have food allergies or not. But they fill a particular need for families who find baking at home to be the smartest and safest option. All the traditional favorites are included, with chapters devoted to the best and tastiest muffins and quick breads, cookies and bars, and all manner of cakes, pies, crisps, and cobblers. In addition, the book is filled with practical advice about dealing with classroom and birthday parties, as well as easy ingredient substitution ideas. 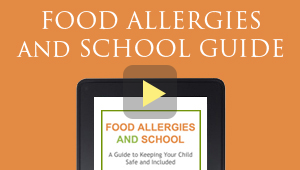 It is the go-to guide for food-allergy mamas everywhere. For a limited time, you can download the Kindle version free. Click on The Food Allergy Mama’s Baking Book to be taken to Amazon to order.